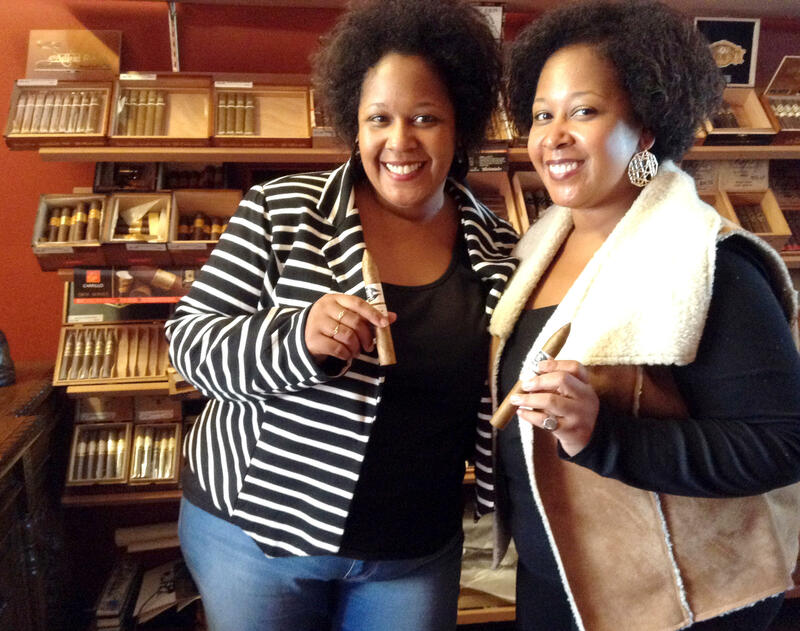 Twin sisters, Yvonne Rodriguez,left, and Yvette Rodriguez, right, explore race in Cuban Culture with their cigar line Tres Lindas Cubanas Cigars. Hear Yvonne and Yvette Rodriguez talk about their personal experiences as Afro-Cuban women and how that inspired their cigar company "Tres Lindas Cubanas Cigar." Yvette Rodriguez is enjoying one of her cigars with a glass of bourbon inside Brickell Cigar Co. just on the edge of Miami’s Little Havana neighborhood where she grew up. 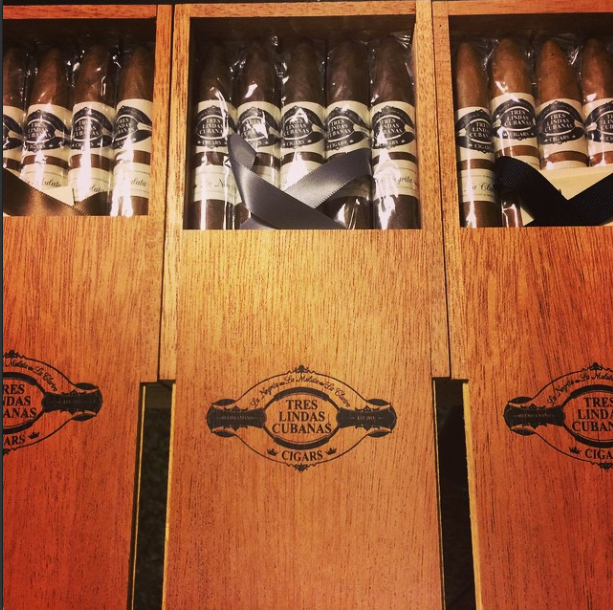 Brickell Cigar was the first store to carry the boutique cigar line she started with her twin sister, Yvonne, two years ago, Tres Lindas Cubanas Cigars. Yvette runs down the names of the company’s three signature smokes. “La Negrita, La Mulata and our Clarita,” she says pointing to the boxes along a brick-red wall. The names loosely translate to: Dark-skinned, tan complexion and fair-skinned. For Yvonne and Yvette, their cigar line is more than just a business venture; it’s an unexpected way to talk about race in Cuban culture and their experience being black and Cuban. Both of Yvonne and Yvette’s parents were born in Cuba where the Afro-Cuban population is large. But the sisters were born and raised in Miami in a predominantly white Cuban community. “It was hard for us to define what we were,” says Yvonne, exhaling a cloud of smoke from a Tres Lindas Cubanas cigar. At school, she says most of her friends thought all Cubans were white. When they looked at her and Yvette with their dark brown skin and curly hair, they were confused. They assumed one of the twins’ parents must have been African-American. Yvette Rodriguez adds even Cubans in Miami are sometimes confused. “They know there are Spanish-speaking black Cubans that exist,” she says. But they’re still surprised when they meet Yvette and Yvonne. The sister says instead of getting frustrated by the almost daily public reaction to them — unapologetic Spanish-speaking black women — they decided to celebrate the stereotypes of race in Cuban culture through something very Cuban: cigars. Their cigar-puffing Cuban grandmother, Esperanza Gonzalez, or Wezee as the twins called her, helped inspire Tres Lindas Cubanas Cigars. “She loved smoking cigars,” Yvette says, “My mom hated it." Gonzalez smoked her way from from Havana, Cuba to Little Havana in 1969. She was very fair skinned; people thought she was white. Her complexion inspired the twins’ lighter “la Clarita” cigar. But Yvonne and Yvette had much darker skin — that’s the “la Negrita” cigar. The sisters say even though Gonzalez didn’t look obviously black, she identified as a black woman, and taught her twin granddaughters to embrace what they looked like. The third cigar name, “la Mulata,” represents all the shades in between the twins and their grandma. Yvonne says when people talk about skin color; they tend to highlight negative stereotypes. She says there can be negative connotations to being called “dark-skinned,” but when she and her sister use “la Negrita” for their cigar, they’re celebrating the positive aspects of being dark-skinned. “When you think of a strong black woman, she’s a leader. She’s the strongest. That’s why our maduro blend is the strongest,” Yvonne says. But Yvonne and Yvette didn’t want their brand to just reflect their race. They also wanted a way to proclaim their Cuban heritage. So while the cigar names tackle racial stereotypes, their company name — Tres Lindas Cubanas Cigars —pays homage to Cuba and an old Cuban song by the same title. "It’s like a Cuban anthem,” says Yvette. “When the song comes on the Cuban woman gets up." Shouldn’t Miami Hip-Hop Hit Harder? The lineup for Dope Entertainment's Rolling Loud Festival set South Florida hip-hop heads abuzz: the headliners are current favorites Schoolboy Q, A$AP Ferg, Action Bronson and Juicy J. But on Feb. 28 at Wynwood's Soho Studios, those big alternative-hip-hop acts will share the stage with underground South Florida rappers. One of those locals is 19-year-old Denzel Curry from Carol City. The Adrienne Arsht Center for the Performing Arts is commissioning 10 new pieces to celebrate a decade in downtown Miami. The commissions, dubbed 10@10, will all be performed in 2016. They include a dance piece choreographed by Miami native and Alvin Ailey dance director Robert Battle. Battle attended a press conference Tuesday at the Arsht Center and talked about his dance, “The Attention of Souls,” which will debut March 2016. It's said that every writer spends his or her entire life working on a single poem or one story. Figuratively, of course, this means that writers are each possessed by a certain obsession. As such, their entire body of work, in one way or another, is generally an attempt to dimension some part of that obsession, ask questions about it, answer them and then ask many new questions. Film Revives Memories Of Kutsher’s And New York’s Bygone "Borscht Belt"
During the South Beach Wine and Food Festival, we asked eight renowned chefs (some local, some not) to describe greater Miami as a dish. They were gathered at Scarpetta at the Fontainebleau hotel in Miami Beach to talk with Topical Currents host Linda Gassenheimer and with the Miami Herald's Evan Benn and Sara Liss. Hear those interviews below, and read the chefs' food interpretation of Miami after that. Diana Nyad’s most famous journey, her swim across the Florida Straits, started in Havana and ended in Key West. Her newest project – a one-woman stage show – is starting out on the island. The distance swimmer made international headlines when she came ashore in Key West on Labor Day 2013. It was her fifth attempt at the crossing. She was 64 years old. The United States hasn’t imported a thing from communist Cuba in 53 years. Today the Obama Administration set out the rules for changing that. But you won’t see any of Cuba’s famous cigars arriving at PortMiami just yet. The new trade regulations, announced by the State Department, are President Obama’s latest step toward normalizing relations with Cuba. They allow independent Cuban entrepreneurs to export goods and services to the U.S. – something that hasn’t happened since Washington established a trade embargo against Cuba in 1962.